The king parrots are easily recognized as a group by their intensely coloured, shiny red, green and blue plumage and long tails. A.c. chloropterus: Male-red head and underparts; upper mantle black with blue band, extending to nape; folded wing has yellow/green blaze; rest of wing dark green; blue back, rump and upper tail coverts; black tail. Upper mandible orange/red tipped with black, grey/black lower mandible. Eye orange. Female-dull green head, back and wings; dull green throat and breast margined with red; dark green tail. Upper mandible orange/brown tipped with grey. A.c. callopterus: Male-as in chloropterus, but blue band on mantle not extended to hindneck and nape. Female-as in chloropterus. A.c. moszkowskii: Male-as in callopterus. Female-as in male. 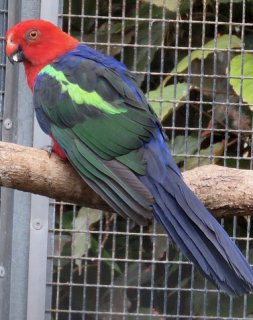 A.c. chloropterus: As in adult female, but red on breast absent; lateral tail feathers tipped with dull pink. Eye brown. A.c. moszkowskii: As in adult female. Calls are described as shrill and metallic, repeated while in flight or alarmed. Also high-pitched, metallic upslurred notes while perched. Small seed mix such as: canary, oats, safflower and a little hemp; spray millet; limited sunflower seed, dry, soaked or sprouted; sprouted pulses such as mung beans, cooked butterbeans and lentils; boiled maize; green leaves such as: Swiss chard, lettuce, sowthistle, dandelion, chickweed; vegetables such as: fresh corn, carrot, celery, zucchini, squash, green beans and peas in the pods; fruits such as: apple, pear, orange, cactus fruits, pomegranate, banana, kiwi; nuts such as: lightly cracked hazelnuts, pecans and roasted peanuts; complete kibble. Not a vigorous chewer; provide ladders, swings, ropes and puzzle/foraging toys. Provide overhead misters or shallow water bowls for bathing. Nest log 10" (25.4cm) around and 4-5' (1.5-2m) deep. Population appears to be stable with no known threats. A.c. chloropterus: E New Guinea. A.c. callopterus: C New Guinea. A.c. moszkowskii: N New Guinea. Found up to 2600m (8528 ft) in dense forest, open areas with casuarinas, cultivated areas and secondary growth forest. Takes fruits, seeds, berries and nuts. Seen singly, in pairs or groups of up to ten individuals. Are fairly approachable in wild. Quiet and inconspicuous while feeding in lower and middle canopy.